Buprestid beetles, also known as metalic wood-boring beetles, are often associated with acacias. Their larval stage (grubs) tunnel through twigs and branches where they are known as round-headed borers. The scale mark shows the actual size of the adult beetle illustrated above. SHRUB: A large shrub often reaching 2+ meters. FRUIT: Narrow bean pods with seeds that remain attached for some time even after the pod valves have opened up. By autumn the reddish pods turn a rich tan-brown color. 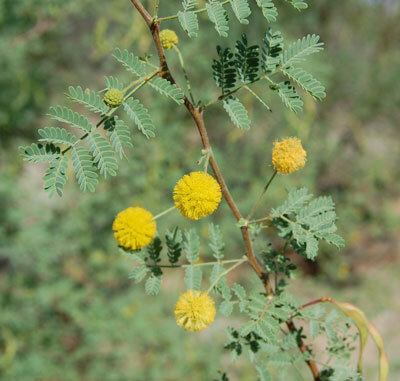 RANGE: Fairly common in the Sonoran Desert of Arizona, but curiously absent from some areas. Can be found growing on bajadas and along washes. LEAVES: Doubly compound leaves are drought and frost deciduous. Observed at Vekol Valley, Sonoran Desert National Monument, Arizona. August 2008. FLOWERS: Dense spherical balls of minute, yellow flowers. Unlike other acacias the flowers are not highly fragrant nor do they attract an abundance insects. Blooming mid to late spring and again after summer rains. ARMED: Paired, straight, whitish thorns will be found on most plants ranging from a few millimeters to two centemeters in length. 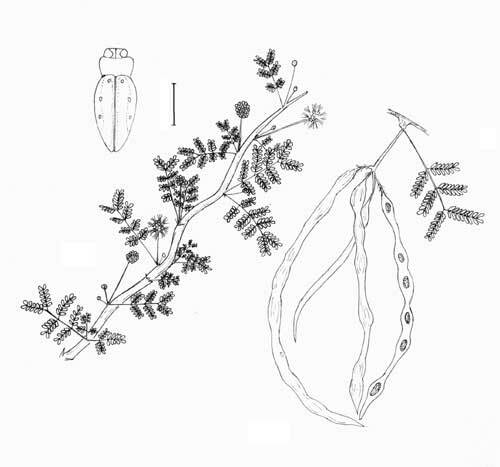 However, some White-thorn Acacias will be found with thorns nearly absent.